Experience, quality, performance, reliability: the strong points of the KRUPPS products are the first allies in their customers’ success. 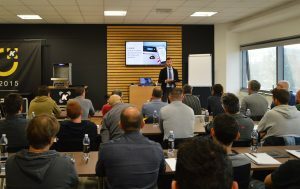 Not simple machines, but technology and innovation coupled with the study of the sector’s professionals, capable of meeting all the requirements of the catering world. KRUPPS is also a synonym of eco sustainability, a company that’s always paid attention to the environment, efficiency and savings. KRUPPS: on your side for over two generations. The attention paid to research and development has played a vital role in the history and evolution of Krupps, constantly committed to creating concepts capable of seeing beyond standards. In 1987 the company developed the clean water washing system, one of the most significant innovations ever introduced into industrial washing processes, capable of matching washing efficiency with respect for the environment. Through the years the use of resources and energy in the research/development/control department has continued with the same intensity, with the objective of ensuring high and constant machine quality level. It’s not just the product that evolves, it’s the company itself. KRUPPS Srl is founded in the historical Padua location of Legnaro that it will occupy for 38 years, till 2003. 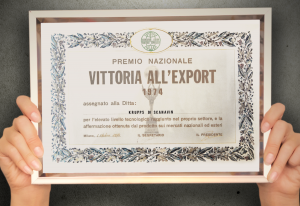 The Company wins the “Vittoria all’Export” National Productivity Award. 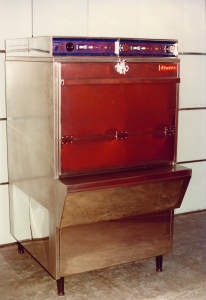 The first Krupps potwasher is launched on the market. First application of the innovative clean water washing system, designed and patented by Krupps. Great restyling of our products; safety and user experience were already key words of our mission. 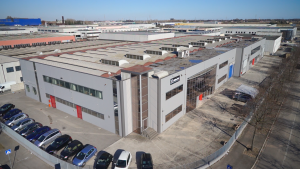 Krupps HQ moves to the current location in Via Austria 19, in Padua with a 6000 sq.m. surface. The Company receives the Gold Medal in the “Concorso per la Premiazione del Lavoro e del Progresso Economico” (Work and Economic Progress Award) awarded by the Chamber of Commerce of Padua. The new CUBE line is launched: simple in its form, solid in its mechanics, this line introduces a wide range of Krupps dishwashers. Launch of the new Soft line. 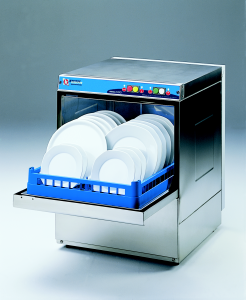 SOFT, with built-in water softener, the continuous and automatic regeneration of resins, prevents limescale build-up and extends the life of the dishwasher. Launch of the new Elitach line with built-in rinse pump and Break-Tank. ELITECH, the top of the line, thanks to new production technologies, ensures impeccable washing quality to satisfy the most demanding requirements. The first promotional video about the KRUPPS business is shot: 6 minutes showing all the stages in the company work, starting from the design of the machine down to the shipping of the finished and packed product. 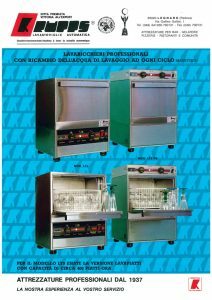 Koral 1100 and Koral 1200 restyling: new dishwashers, hooded with molded tub and double wall. Thanks to continuous research to improve its products, Krupps developed the EWC SYSTEM, an innovative electronic control system which allows you to customise washing programs and provides technicians with easier parameter settings. 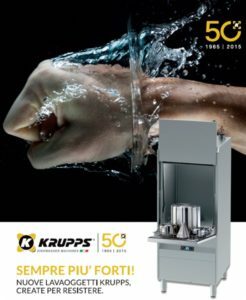 FULL, the pinnacle of Krupps’ quality, guarantees total to partial replacement of clean water at each cycle which results in superior washing performance thanks to the ability of combining different technologies. 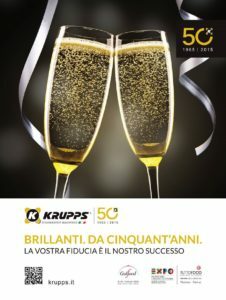 Krupps celebrates its 50th anniversary. Our commitment and passion over the years enables us to achieve important goals. YOUR TRUST IS OUR SUCCESS. A new project borns: the WASHING ACADEMY, a place in our factory for training engineers to become experts in the Made in Krupps Technology. The UNIKO touch display and the remote control system IKLOUD were introduced in the market.